Some years ago a Lebenese business firm called Wadi Holdings started using salt water they found after drilling for sweet water in north eastern Egypt. That was in the Wadi Natroun area not so far from the Mediterranean Sea, located along the road between Cairo and Alexandria. This was also the place were in ancient times salt was collected to preserve the mummies. The saline water, unsuitable for growing crops was now used for cultivating sea bass (Dicentrarchus labrax) and bream (Sparus aurata), two species normally found in sea water (see picture of the basins, left). The firm is doing good business and its product is even exported to various countries. Egypt is still struggling with an old and steadily growing problem. That is the need to increase wheat productivity to feed Egypt’s rapidly growing population which has nearly doubled in the last 30 years. Traditionally, fresh water from the Nile (‘a Gift from the Gods’) and lake Nasser, a vast man-made lake created by the construction of the Aswan dam in the Nile have been used to irrigate the land in the valley and delta of the Nile river. But fertile land and water are scarce in Egypt, and the shrinking water supply provided by the Nile flowing upstream is a growing concern of the government. Its hope for the future is to start exploiting areas in the Western desert with its (presumed) groundwater reservoirs to help Egypt reclaim up to 1.5 million hectares of land. As saline water could not be used for irrigation, one assumed that water drilled closer to the seashore was unfit for growing crops. But these views are now changing. Experimental farms in the Netherlands have managed to grow healthy and tasty vegetables in soil irrigated with salt water, using pipe and drip irrigation. Two tasty product of saline agriculture are salicornia and potatoes. Especially the potatoes seem to be doing well. 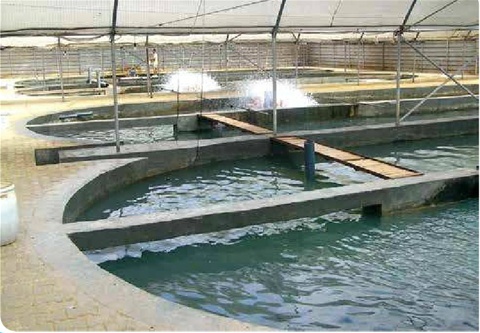 Another idea supported by the agriculture department of the University of Wageningen in Holland was to use the salt water of the sea bass and bream ponds in Wadi Natroun to start growing saline crops. Instead of pumping away the wast water it is now recycled using drip irrigation in the desert soil in the vicinity of the aquacultures. So combining aqua- and agricultures in the desert may be a promising basis for compensating future crop shortages in Egypt.